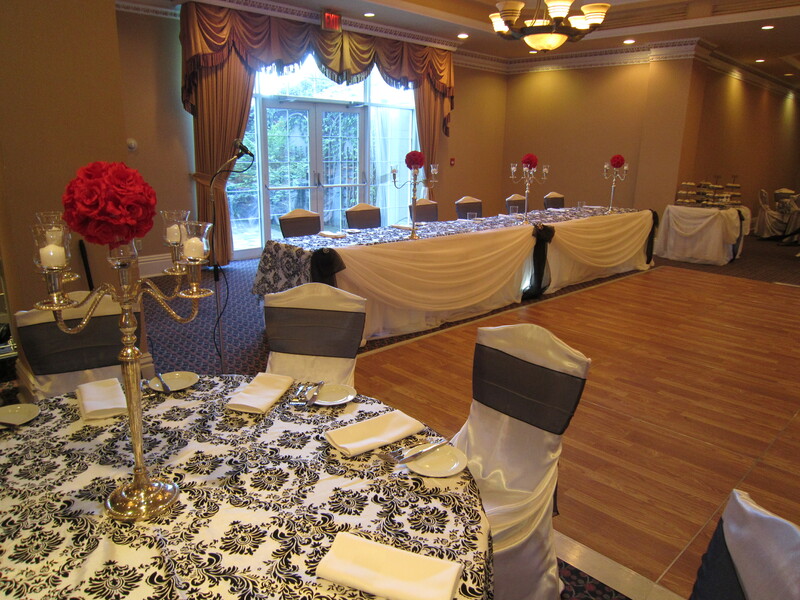 Set The Mood Decor had the pleasure of decorating at Queens Landing in Niagara On The Lake, today. 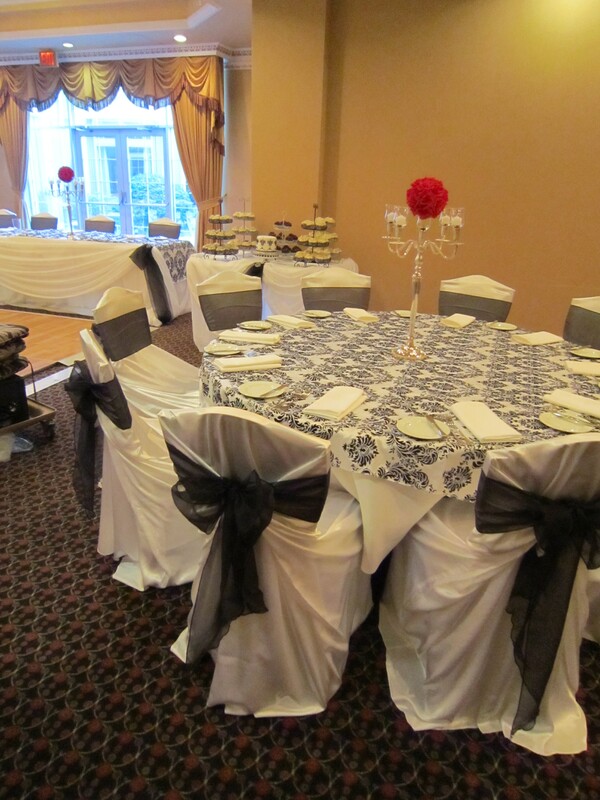 We provided our white satin pillowcase style chair covers with black organza sashes. 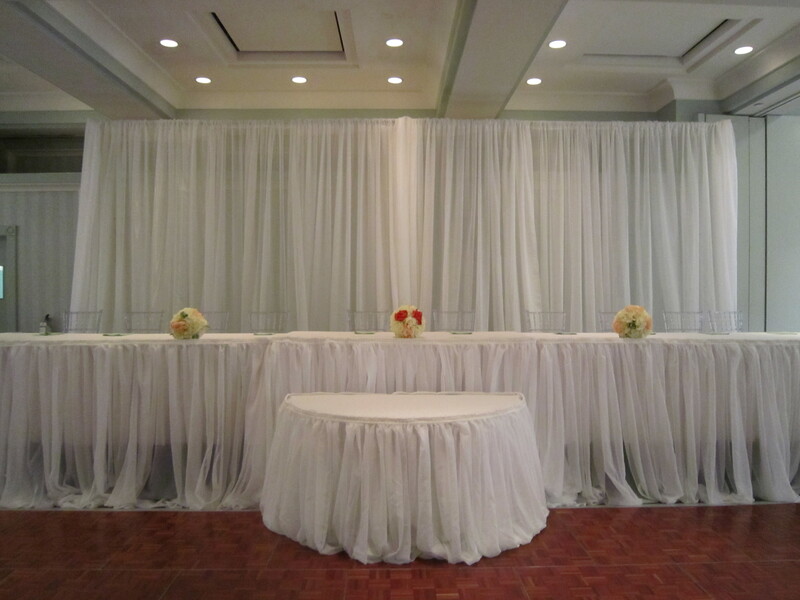 Head table and cake table draping in sheer white voile with spot lights and black organza in the focal points along with crystal embellishments to finish the look. 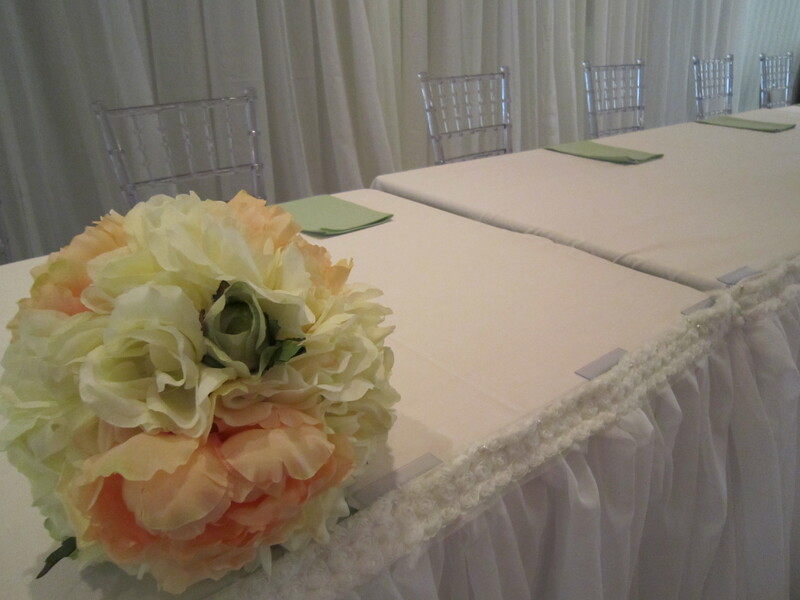 We also had the pleasure of creating a beautiful bridal bouquet and bridesmaids bouquets. The brides bouquet was approx. 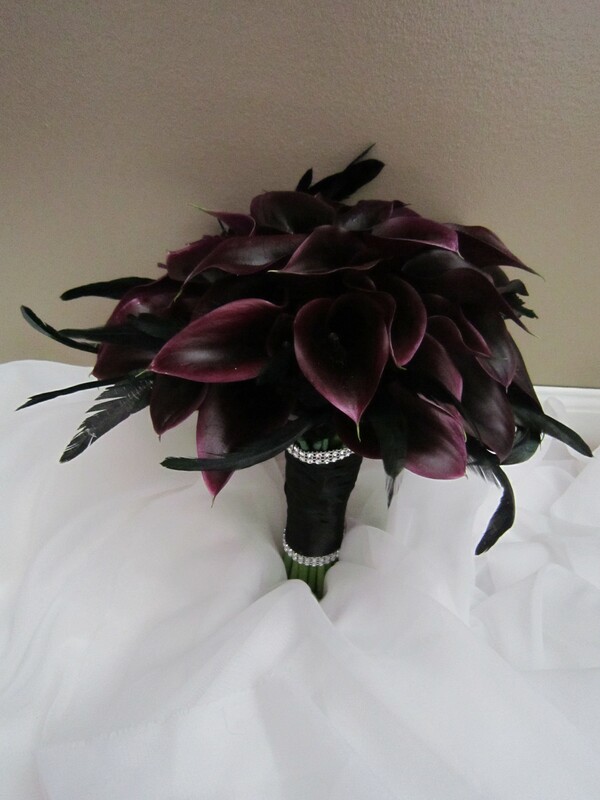 50 mini black calla lilies with black feathers around it as well as black satin ribbon. 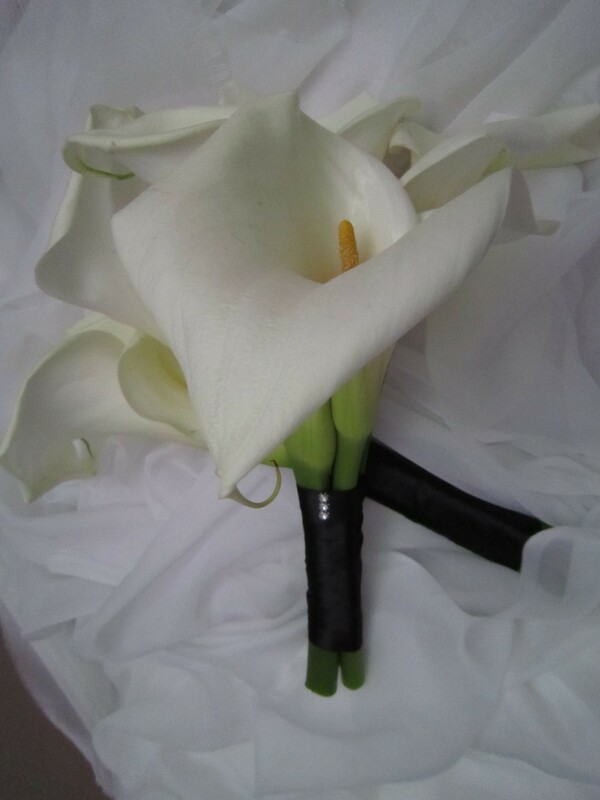 The bridesmaids had 4 large white calla lilies with black satin ribbon. 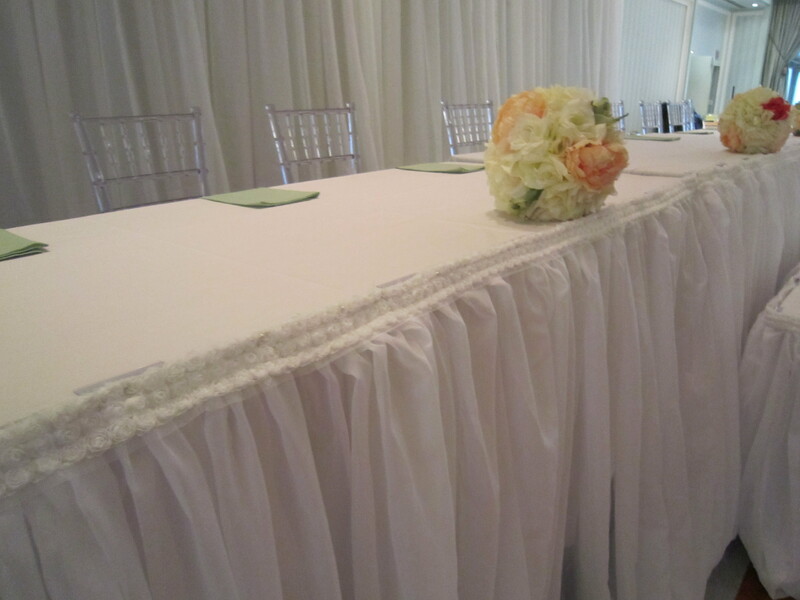 Congrats to Michelle and Neo on their special day! So many great shots from this weekend. 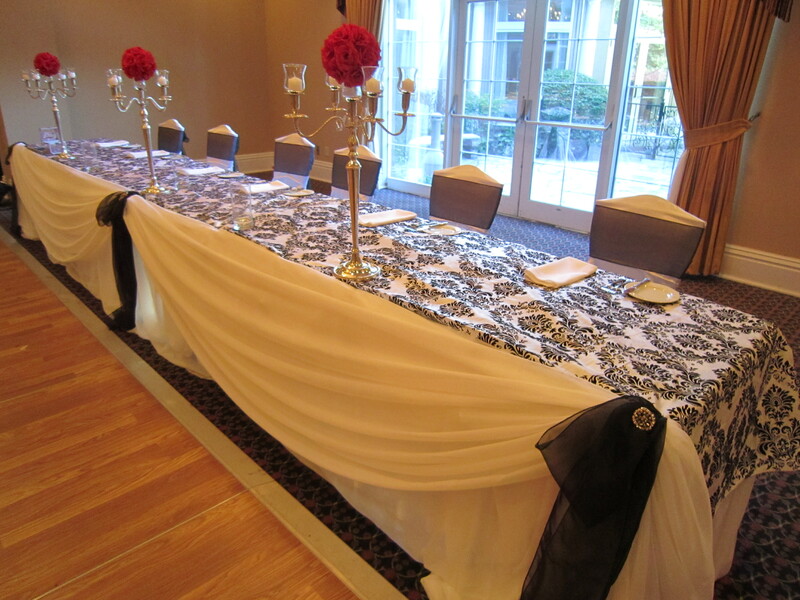 We had a fabulous time decorating for Erica and Jason’s second wedding and first at home reception! It was nice to do something so fresh with some great spring/summer colors. 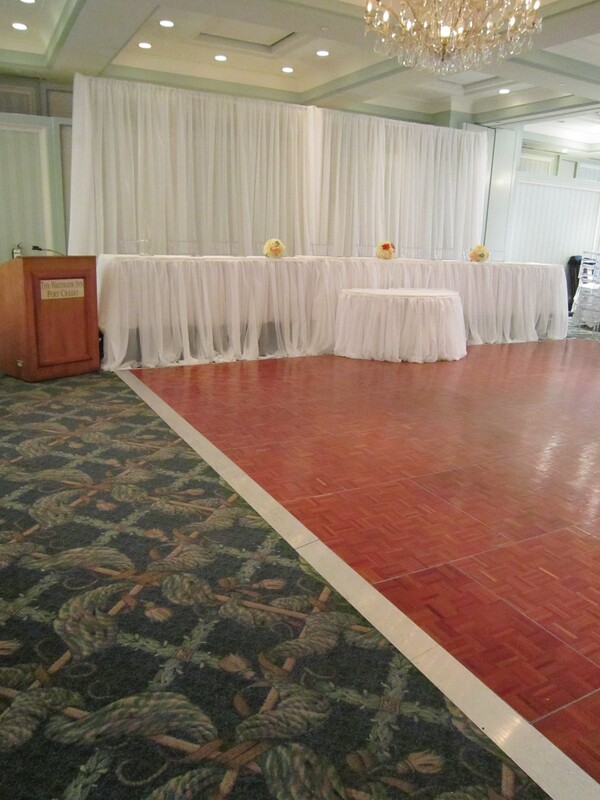 The location was the Waterside Inn, Mississauga; which has some excellent views of the lake. 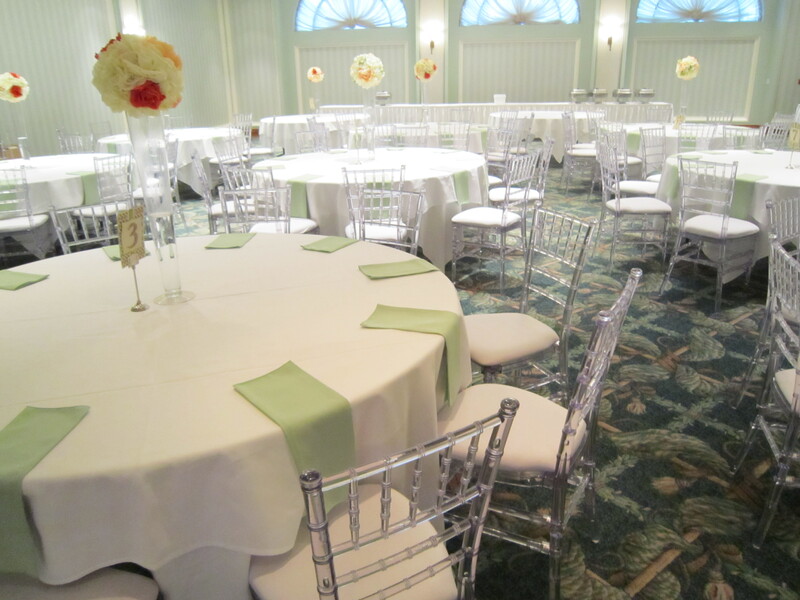 Set The Mood Decor provided custom flower balls, which are alternating on the tables; ivory, peach, orange and ivory, peach, sage green. 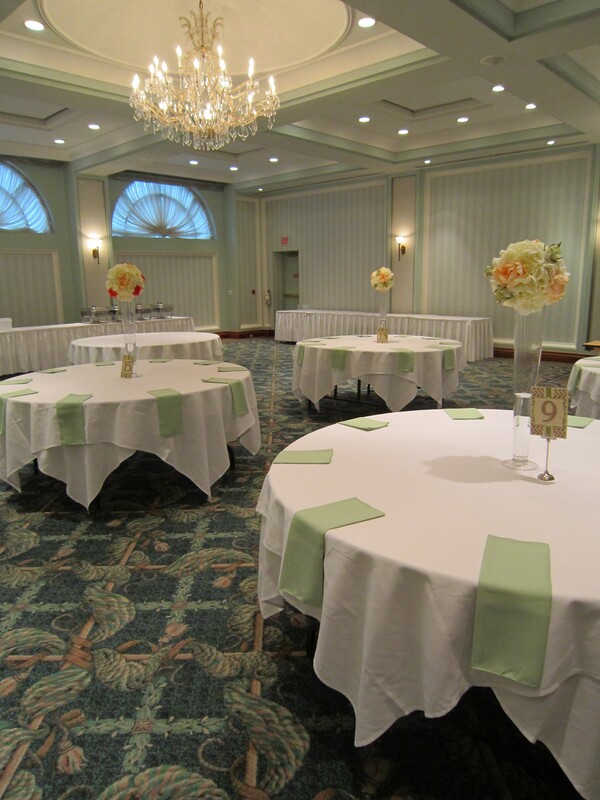 Working with the room color instead of fighting it; we added sage green polyester napkins with a regular fold but hanging over the table, which you can see very nicely with the fabulous addition of the clear chairs. 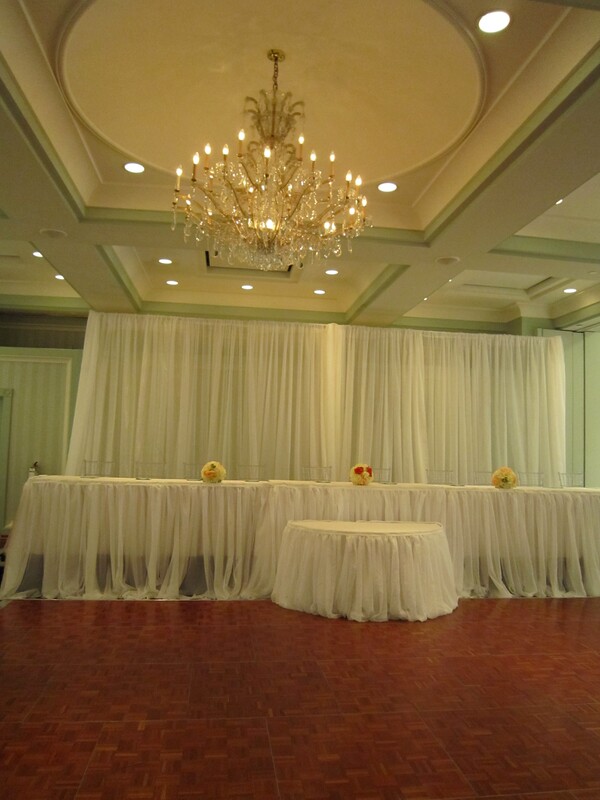 This wedding features our New Head Table Option, which is elegant, streamlined, simplistic with a great feel of romance. As you can see by some of the close-ups there is a strip of very small rosette’s across the top of the fabric for that perfect elegant finish. 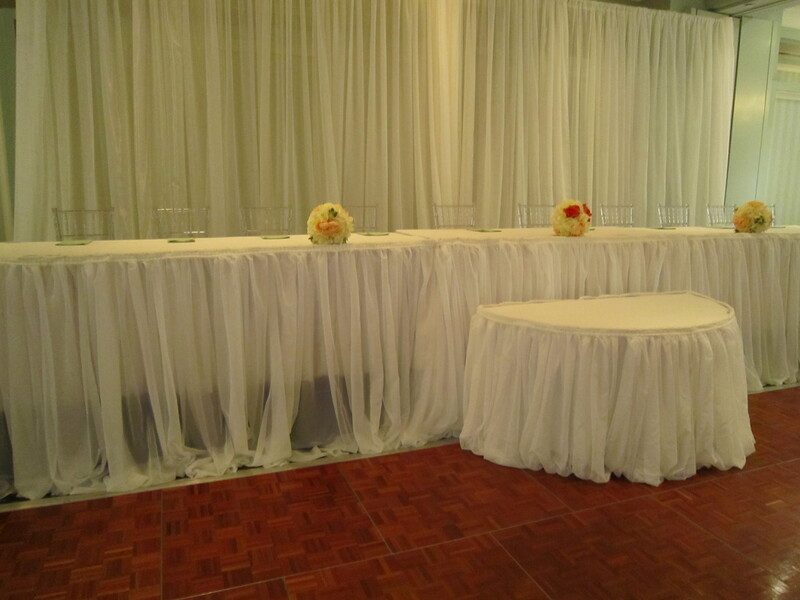 Working with the same look we provided a simplistic backdrop that provided the same feel as the head table. What a romantic look! What an exciting event to feature! Congrats to the bride and groom on their special day! !